or throw it in the backseat of your car! No matter where you find yourself, the lightweight Gourmia GMF600 Cooler and Warmer is effortless to take along for the ride. Designed for optimum convenience, all it takes is the flick of a switch to chill those soda cans up to 32°F below ambient temperature, or warm your food up to 150°F. The GMF600 utilizes the latest thermoelectric technology to ensure uncompromised functionality without harming the environment. It’s time to take your office lunch, road-trip snacks, and tailgate beers to the next level! 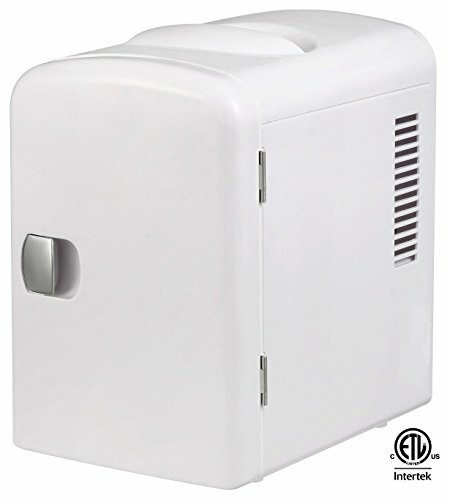 COMPACT & PORTABLE: This lightweight 6 can mini cooler & warmer features a removable shelf, self-locking latch, and carry handle- all designed for easy portability. Fit it anywhere- or grab it and go! COOL OR WARM: Easily choose to chill up to 32Â°F below ambient temperature, or warm up to 150Â°F (in an ambient temperature of 75Â°)- with the flip of a switch. Well insulated interior holds temperature even after unplugged. GO GREEN! : This eco-friendly product was engineered with thermoelectric technology. It uses advanced semiconductors that are free of CFC's and refrigerants, making it better for the environment. AC & DC INCLUDED: Included are 2 detachable power chords, 1 AC for wall outlets, and 1 DC for cigarette lighters. Use at home or on the road! ETL CERTIFIED: We, at Gourmia, take the quality of our products seriously. This product is ETL certified so you can be sure that youâ€re receiving a safe, efficient, high quality appliance.